Average Time (H:MM:SS) is 0:55:00. Range is 0:37:10-1:47:40. The course is 13 miles long. The biker may help the canoeists carry the canoe from the river to the finish line (about 30-40 yards). Timing Chip handoff can take place anytime between the river bank and the Canoe finish line banner. The biker is responsible for the canoeists’ finish time. 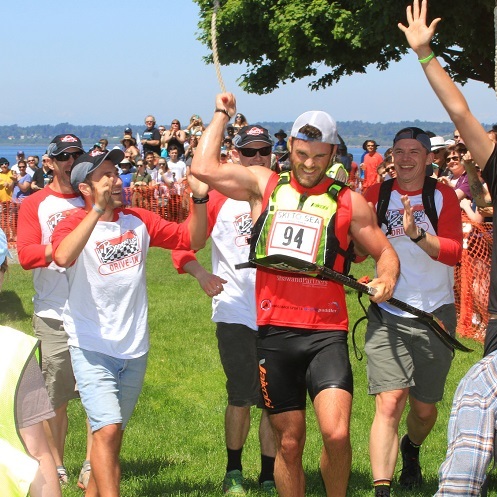 Please be in position when your teammate is approaching, take the chip from the canoeist, swipe chip to create a canoe finish/bike start time, ride the approved course and then pass the chip to the kayaker at Squalicum Harbor. The timing chip will be on a wrist band and must always be worn by THE RACER to ensure accurate times. The biker may have a helper get his/her bike out when his/her team is coming in to finish the Canoe Leg. The helper may not give the biker a push to get started. Generally, the S2S course is designed to challenge all types of riders, which is not as easy as it sounds. Riders with little experience will be able to get through this course, and the most experienced riders will feel it in their legs and have a fun time. There is not a lot of challenging terrain between Ferndale and Bellingham, and we do our best to extract the most interesting course we can, given that challenge. It is not an extremely technically demanding course but will challenge riders of all abilities. Of course, weather and trail conditions at the time of the race will determine its technical difficulty. The course may change slightly year to year. There will be a PRE-RIDE on Saturday, May 25, 2019 from 1-4 pm ONLY. The course is subject to last minute changes. We have not provided detailed instructions on the course because we don’t want riders trespassing over private property while trying to practice. Much of this course is over spongy open fields, single track, double track, and varying urban elements so be prepared. Vehicle drafting is prohibited. Bikers may not follow closer than 50 feet from any motor vehicle at any time. Outside assistance along the course is not allowed and there are no services provided (other than emergency communications) along the course. Racers are allowed (not required) to help one another with repairs in order to complete the course. We recommend racers carry basic tools for on-course repairs. The race committee’s official monitors will be at set intervals and violations of these rules or deviation from the course will result in the entire team’s disqualification. The course is approximately 13 miles long with most on gravel or dirt. 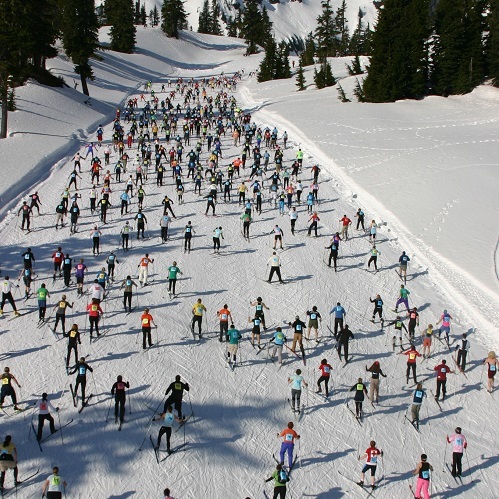 Racers will be responsible for knowing the course. The course will be well marked on race day. All traffic laws shall be obeyed. Volunteers will be stationed along the route to keep racers on course and make sure each biker is going through all of the features. It is the rider’s responsibility to know the course and be attentive to race day trail markings. After the exchange from the canoeists, there will be a series of cyclocross style obstacles in which riders will need to maneuver, tight turns, barriers etc. The latter half of this section passes through open grass fields that can be very wet, muddy, and leg-sapping. It may seem easy, but the open field sections will sap your legs quicker than you think, leaving you struggling at the end. This section is relatively flat. There is a mix of urban riding and pavement combined with some grass, a gravel parking lot with a curb to get over. You will traverse commercial lots and parking areas that skirt many of Ferndale’s businesses. This is followed by a series of fields and a double track gravel road that send you towards Smith Rd. When you cross Smith Rd. there is a short section of double-track(ish) that leads you to a lightly technical single-track section that will offer some variety to the ride. Pay close attention to the course markers (bright orange) and stay to the right when there is room to pass or be passed. Just prior to getting to Slater Rd, there will be a gravel lot to the right that you will enter and go to the corner of, in the corner of the lot will be a “run up” that will be a dismount, run up the grass hill to the intersection of Slater and Rural Ave. PLEASE DO NOT ride this section of the course outside of the designated pre-ride day and time described below as you will be trespassing on airport property. This section is a more diverse section with road riding, open dirt roads, mud, single track, wetland (low elevation), wood bridges, and some more leg-sapping open field riding. There is some elevation gain/loss in this section and some technical areas that may challenge some of the more novice riders and offer a fun respite to the more advanced riders. This section mixes it up with road riding, green trail paths, some gravel paths, and a set of stairs. There is a bit of climbing/descending on this section. PLEASE pay attention and obey course workers and signage. 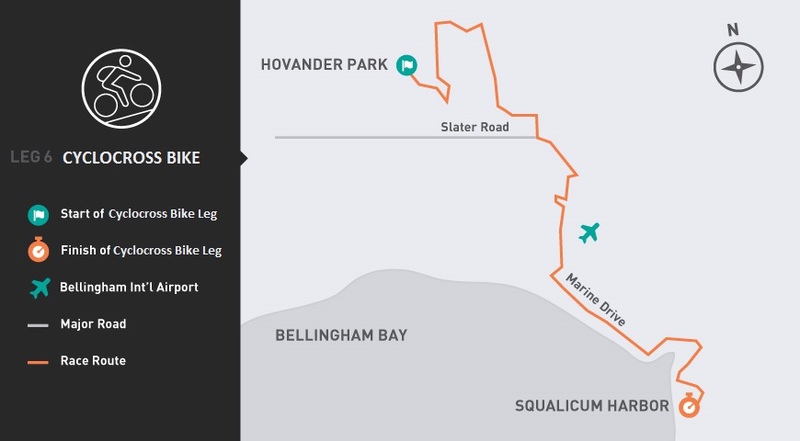 Riders will exit off Marine Drive, to the gravel trail that leads to Little Squalicum Park and make a right turn down the hill toward the lower trail, then turning left up the trail to cross Illinois Street. There will be a sharp U-turn on gravel that you will need to control your speed on as you will work your way into Squalicum Creek Park. There will be some cyclocross course features, including a set of stairs and there is another corner on gravel that you will need to watch your speed at the bottom of the hill. The final mile of the course follows pavement and puts riders at Zuanich Point Park for the transition with your kayaker. 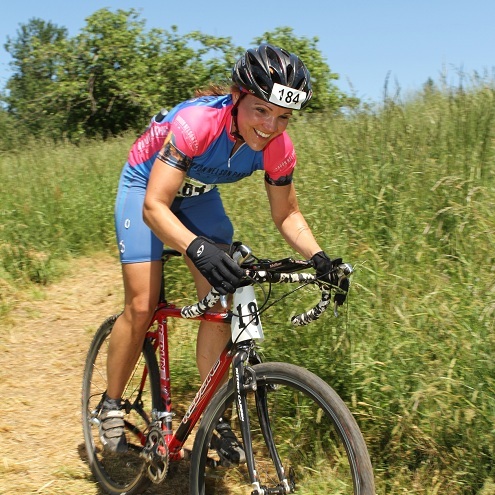 There will be a pre-ride on the Cyclocross Bike course on Saturday, May 25, 2019 from 1-4 pm ONLY. The course will be marked but all riders need to be aware that they must obey all rules of the road (including but not limited to Stop signs and signals) as there won’t be flaggers or officers at intersections. There will be a pre-race meeting held at 11:00 AM on race day at Hovander Park at the sandbar on the river. IT IS MANDATORY THAT ALL RACERS ATTEND THIS MEETING TO GET THE LATEST SAFETY INFORMATION ABOUT THE COURSE. Race Timing Chips will consist of the chip on a wristband, and must be passed onto the next racer at each leg exchange area according to the rules. Cyclocross Biker: take the chip from the canoeist, swipe chip in front of the bulls-eye to create a finish/start time, bike your event, and pass the chip to the kayaker. A designated team representative must pick up the team’s race packet prior to the race. The packet includes the team timing chip, racing bibs & T-shirts. The designated team representative must distribute items to team members. There will be no racing bibs at the exchange areas. There are no restrictions on what bike you can use, (the exception being recumbents and Ebikes) but all bikes must be in good condition. While you can use a Mountain Bike for this Leg, Cyclocross Bikes are strongly suggested as well as tubeless tires (with sealant) due to blackberry bushes and other obstructions that may cause punctures. Keep in mind that there will be mud, loose gravel, and grass; basic off road conditions. Tire width restrictions will not be enforced, however, please note that helmets are MANDATORY. Helmet stickers are being provided with your team number on it in order to make it easier to announce your arrival at the leg finish. A race official will inspect each bike prior to the race to make sure bikes comply with rules. I-Pods, MP3, Walkman or similar music/audio systems are NOT allowed to be used by the racers while competing. On-site race officials will determine the time for an early release if your teammate is late in coming into the Race Exchange area. Be sure to attend to Pre-Race meeting on Race Day for details. Bring your bike ready to race! Lenny’s Bike Shop is generously providing us with a bike mechanic at Hovander from 11:30-3:30 so please see them for last minute repairs and thank them for volunteering. If you want to volunteer for the Cyclocross Bike Leg of the race, please fill out our Volunteer Form.